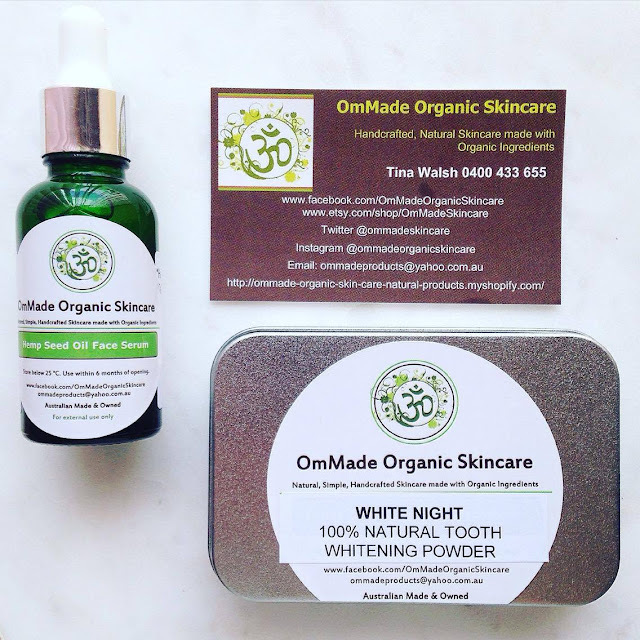 Om Made Skincare are an Australian company based in Adelaide that handcraft 100% natural potions for your face and body. They offer a diverse range; from sunscreen, to oral care, to cleansers and body scrubs. Om Made sent me two products to test out and post an honest review for my readers. I received their White Night Tooth Whitening Powder and Face Serum. To me, this is a hybrid of oil and serum. It is truly a unique formula, that applies to my face like silk. I have never used a product that makes my face feel so velvety before. It saturates my skin with moisture, but without the oiliness of an oil, and without the stickiness of a serum. It just leaves my skin so comfortable that I can often forgo a moisturiser afterwards. I apply about six drops (you might need less) to my face after I cleanse. I love it! It contains a blend of my favourite skin care ingredients. In fact, it is like this serum was created for me! The first ingredient is Hemp Seed Oil, which is an excellent all-rounder oil suitable for all skin types including acne-prone. Carrot Seed oil is the second on the list, which happens to be my very favourite oil. It is an essential oil with a natural SPF of 38, high levels of vitamin A, and significant antioxidant, antiseptic and antifungal properties. Red Raspberry Seed oil is also included for its high fatty acid content, vitamin E and natural sun protection qualities. 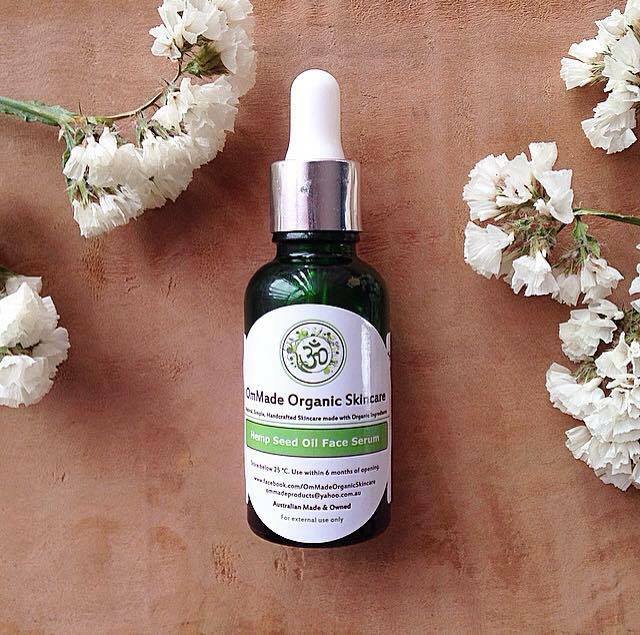 Rose Geranium lends the most beautiful fragrance to this serum, and helps balance the oils in our skin. Finally, the powerhouse ingredient Kakadu Plum is included. Kakadu Plum is the highest natural source of vitamin C on the planet! Vitamin C is amazing for brightening the skin, boosting collagen levels, fading scars and more. My skin laps up this liquid goodness and it really helps heal my acne scarring quicker than if left to heal alone. I really love this serum and can see it taking up permanent residence in my skincare collection. Ingredients: Hemp Seed Oil, Carrot Seed Oil, Red Raspberry Seed Oil, Rose Geranium Essential Oil, Kakadu Plum. 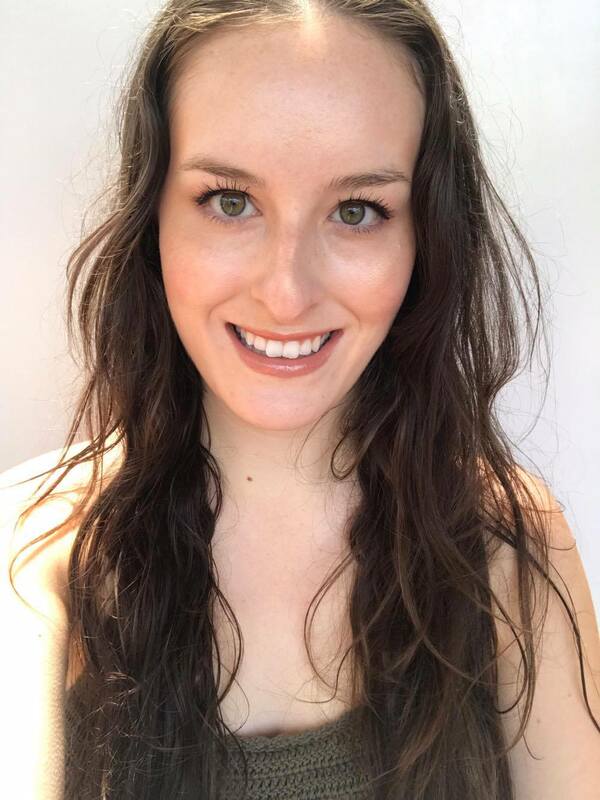 I was really curious about trying a truly natural oral product that aims to whiten teeth without causing any teeth sensitivity or gum damage. Although my teeth aren't particularly stained, I am always looking for a way to get a brighter smile. 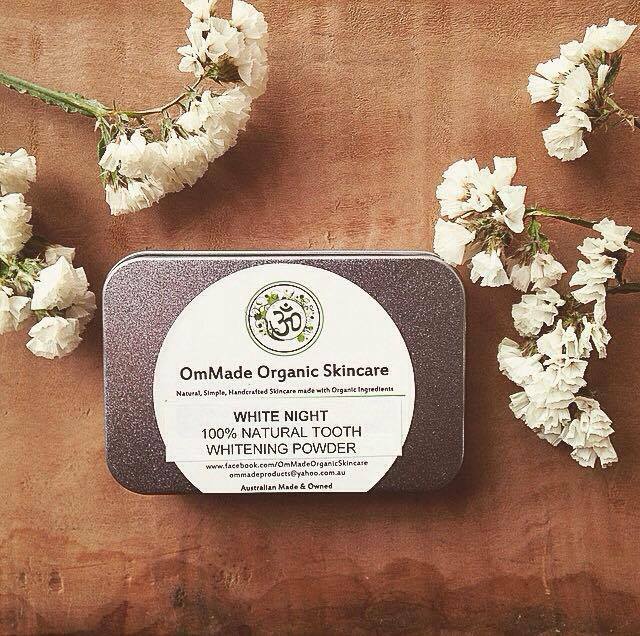 White Night Tooth Whitening powder comes as a black powder in a metal tin. The dark shade of the powder may be offputting to those that aren't aware of the main ingredient; Activated Charcoal. Om Made's Activated Charcoal is medicinal grade, steam activated and 100% plant based. Charcoal is a highly absorbent substance that has the ability to pull toxins out of the mouth and remove stains, prevent cavities and kill bacteria responsible for gingivitis. Sandalwood powder is also used in this formula for its antiseptic, astringent, anti-inflammatory and disinfectant properties. Bentonite Clay is also included and is amazing for remineralising teeth, and contains minerals necessary for health enamel. To use, I wet my toothbrush and dip into the powder. I then brush my teeth for 2-3 minutes gently, giggling at how black my mouth appears. After I rinse properly though, all the black washes away, and I am left with the smoothest, cleanest feeling teeth. I have noticed a subtle whitening and brightening of my teeth over the past few weeks, which I love! Ingredients: Activated Charcoal, Sandalwood Powder, Bentonite Clay, Fullers Earth Clay, Peppermint, Lemon, Cinnamon and Clove Essential Oils. I really love both of the products I have tried from Om Made and it has made me curious about the other products they offer. The quality of these products are exceptional, and they are really affordable too. Check them out on Om Made's website.